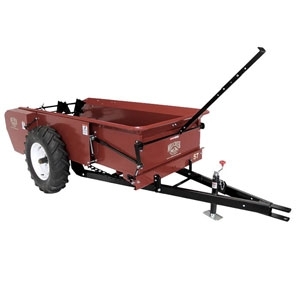 Millcreek's Mid-Size manure spreaders are made farm-tough with heavy gauge steel and wear-resistant features for the low maintenance, long-term reliability you need. The 57 & 77 have a heaped capacity of 56 cu.ft. and 72 cu.ft. respectively and can be towed with a compact tractor. These spreaders can easily accommodate a large stable of up to 20 horses. Both models are available in your choice of either Ground or PTO drive.